Fun, Resourceful, Informative! Recommended by Librarians. Learn where to locate the tools and programs that make your job easier. See examples of graphic design projects librarians are creating and learn how to create your own. Learn professional tips. Unit 1 opens the first week, access at your convenience and interact with other participants and the instructor on the forum, read the lecture, and watch the videos. Unit 1 will remain open throughout the 4 weeks, Unit 2 opens the second week, etc. There will be an additional 2 weeks to catch up if you have to miss a week. Librarians are often asked to communicate or speak a visual language. The Graphic Design for Librarians class gives you the rules and tools for meeting that challenge not only possible but fun. The four week class gives you an opportunity to network and share ideas with other librarians who are actively engaged in what you are doing. No prior art experience is needed or required to learn simple guidelines for making those graphic design tasks easier and more effective. You will concentrate on flyers and posters the first two weeks and then get an overview of many more graphic design projects the next two weeks. You will decide which project interests you. Librarians across the country and internationally have taken the course. What have librarians who have taken the workshop wrote about the class? Here is a small sampling of the many positive comments that have been received. The most helpful information to me was regarding fonts and how to utilize them for ease in reading and eye-direction. I also tend to want to utilize all the space in a flyer, and learning to use white-space as part of a design, will help me to simplify. I also benefited from a lot of sites that offered graphic design “terminology”. I am self-taught, so having some of the more technical terms, and knowing what they mean, helps me to feel more confident in my skills and talking to others about my projects. I learned that I need to be more aware of font, color, and placement. I liked the guidance and direction that was given to us for this project, but I especially loved how you let us use our own creativity for the project. So much fun! The most helpful information has been the links to free image sites. . .now I have a ridculous amount of images to look through. The links to the templates and the link to the free graphic design software was particularly helpful. The most beneficial aspect to me was seeing so many examples of what other libraries have done with signage, social media, etc. I've bookmarked some sites and am returning to them as idea sources for infographics or quickly make something that looks professional. My flyer designs have improved 200% since starting this class. Overall, the visual examples and the links to resources have been the most helpful to me. The exercise of creating a flyer from scratch was eye-opening and enjoyable. . . The video clips were clear and informative. Instructor Valerie Colston, M.A. is a university art history instructor and author of Graphic Design for Librarians: A Practical Guide for Librarians published by Rowman & Littlefield. She has many years of experience developing and presenting Library programs through her company Art Teacher on Net. She also teaches Graphic Design for Librarians throung Infopeople, and has taught an developed Graphic Design for Librarians at University Extended studies including University of Wisconsin Extended Studies and at Simmons (Boston.) Her book 200 Projects to Strengthen Your Art Skills published by Barrons Educational Series has received outstanding reviews. Her artwork has been exhibited in a number of libraries throughout the US and at the Orange County Contemporary Center for the Arts in Santa Ana. 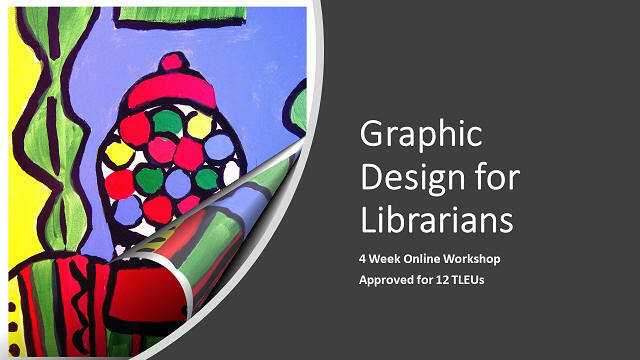 This class has been approved for 12 TLEUs for Indiana Librarians. All librarians, library teachers and staff are welcome, nationally and internationally. Sign Up Today. This is a 4 week workshop only $99.00 (USD) UK, Canadian, Australian and other currency accepted on the Pay Pal secure website. You may purchase the class through the secured pay pal site (using your own credit card or paypal) below or if your library is paying for the class a Library Invoice will be provided. Please contact me at art259@hotmail.com or crafts@artmuseums.com for more information.